Country: Netherlands | Beer Apprentice - Craft Beer News, Reviews, Interviews and Info. Hi guys. For today’s craft beer review I’m going to be trying the Emelisse TIPA produced by Brouwerij Emelisse located in Kamperland, Netherlands. I’ve never had a brew from these guys. As a matter of fact, I had never even heard of them or seen a beer on the shelves, so when I saw it I had to pick it up and give it a try. I found their website, emelisse.nl, and I copied the commercial description for everyone. This beer came in an 11.16 oz. bottle and it boasted an ABV of 10.0%. It poured a hazy, dull orange to caramel color. The cap was of an egg shell tint, somewhat smooth and kind of soft. It was sized well and the retention time was solid. The lacing was thick and clingy and a lot was left on the sides of the glass as it worked its way down. The nose burst with a strong caramel malt. A hint or two of tropical fruit. Mostly pineapple. Quite a bit of resin and earthy hops along with a robust bready malt and a light waft of booze. The taste released a great shot of sweet caramel malt and bittering hops. More pineapple, however with an additional relish of orange citrus. Bold piney and resinous characteristics with definite savors of alcohol. The mouthfeel was medium to medium/full bodied. Smooth, sticky, chewy and thick. Medium to low carbonation with a good deal of warmth and a ton of flavor left behind on the palate after the swallow. Overall, I found this to be a very good beer. It was hopped to death that’s for sure. It was more of a sipper for me. I could probably only have just one during a session. It’s not too far removed from a heavily hopped American Barleywine in my opinion. Just a little less intense. It’s easily worth a try if you can get it. I’d really like to try another brew from these guys to see what else they are concocting. 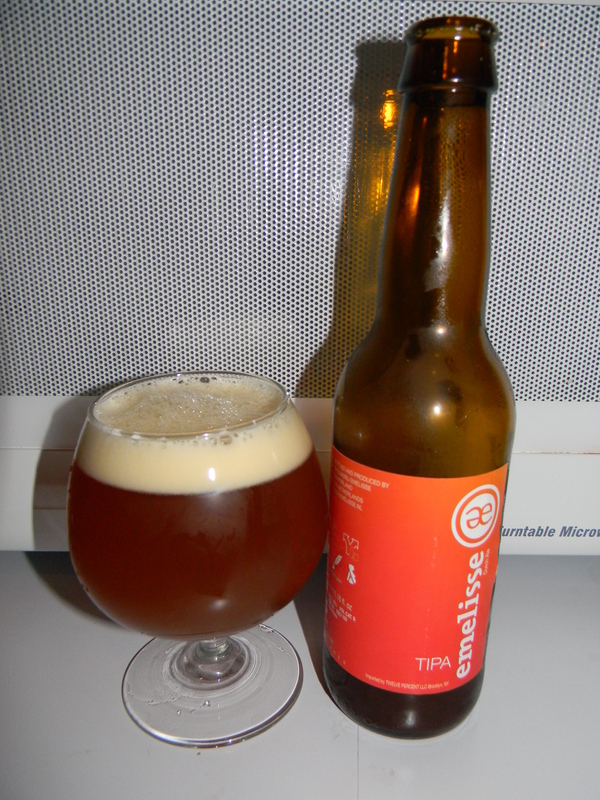 So, the next time you guys go beer shopping, look for the Emelisse TIPA and give it a try. I think you may like it. Hi guys. For today’s craft beer review I’m going to be trying the La Trappe Quadrupel produced by the Bierbrouweij De Koningshoeven B.V. Brewery located in Berkel-Enschot, Netherlands. I don’t know much about this brew to be honest, so I’m going to go ahead and jump to the website, http://www.latrappe.nl/, to find some information. It poured a burgundy/brown color that was semi-hazy. It had an eggshell colored head that was of real good size. It was smooth, somewhat creamy and soft. The retention time was excellent and the lacing looked real nice too. This was a very attractive looking beer I must say. The nose brought forth some wonderful hints of banana. Spices of clove and coriander. Well suited and well balanced fragrances of yeast, baked breads and dark fruits akin to dates, figs and raisins. It smelled quite candy like also, with hints of sugar and caramel. Even though the ABV was 10.0% I didn’t find a very strong alcohol presence within the bouquet. I definitely got more of the alcohol (rum) in the taste. Further savors dates, figs and raisins. The banana aspect was somewhat reserved on the initial tasting, but as the brew was allowed to open up it became much more noticeable and refined. Actually, the overall flavor became much more “round” and harmonized as it warmed to be honest. Some peppery spice and clove were easily noticed as was the Belgian yeast and breadiness. The caramel malt added a bit of sweetness, which created a tad more complexity. This beer seemed to get better and better with each passing sip. The mouthfeel was a very strong medium. It was mostly smooth and dry, however I didn’t find that it was terribly creamy. The carbonation was pleasing as was the fair amount of burn and warmth that was felt with the first few sips. A good amount of flavor was left behind on the palate after each swallow too. Well…. we have another very, very good beer right here. This brew only got better as I went along. It’s rather “big” and sturdy, however I didn’t have any trouble drinking or finishing the whole bottle. It had plenty of flavor and I think that it definitely holds true to the style. I would recommend it that’s for sure. This could be another one of those beers that I would want to pick up and let it age for a few years to see how it would develop. 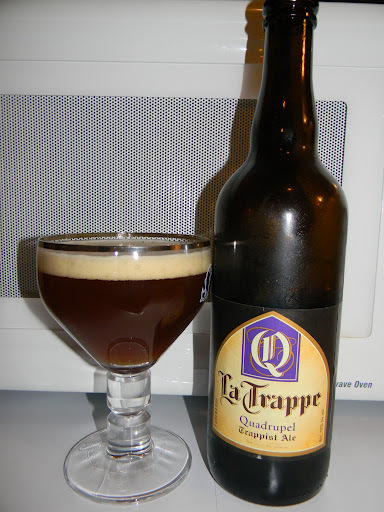 I could imagine that the La Trappe Quadrupel will only mellow and become more refined with time. With that being said, it’s still a most enjoyable drink when fresh, so pick up a bottle and give it a try. If you favor those big, Belgian Strong Ales, I think you will like this one. I, personally, don’t think it’s quite on par with the Rochefort 10 or the St. Bernardus Abt. 12, but it’s a worthy substitute. Are you guys ready for another craft beer review??? How ’bout we try one from Berkel-Enschot, Netherlands??? The beer I chose to share with you today is brewed by the Bierbrouweij De Koningshoeven B.V. Brewery. It’s called the La Trappe Dubbel Trappist Ale. This will be my first beer ever from this brewery, so I don’t quite know what to expect. Let’s see what the description from the website (http://www.latrappe.nl/) says. This beer has an ABV of 7.0% and comes in a 25.4 oz. bottle. The pour produced a burgundy to very deep ruby red color with a few dark orange highlights around the edges. The crown was tan, mostly creamy, full and had nice girth. The retention left a bit to be desired and the lacing was “so-so.” After a few minutes the head dissipated completely and left no remnants even after several aggressive swirls. The aroma provided very prominent notes of fresh, dark grapes. Straight forward hints of cloves with some fruity cherry notes too. A baked, pie crust aroma was noticed that really stood out and appealed to me. A touch of caramel malt along with some yeast and a slightly earthy hop tone. I even got a smell similar to licorice jelly beans. Very complex with tons of stuff going on in the nose. With the first sip, I received more of the dark, fruity grapes followed by a hint of alcohol. It seemed to be a touch tart and sweet for the first little bit, but a very nice baked bread came on stronger through the middle, which helped pull some of the edge off the profile. Not much by way of hops or bitterness I didn’t think. Further spicy flavors of clove and pepper mixed with a sugary caramel malt completed the analysis. As the brewed warmed and developed the sweetness started to subside considerably and let more of the bready malt and spices come to fruition, which created a more balanced flavor in my opinion. The mouthfeel was medium, very smooth and mostly dry. The carbonation was good I thought, but only an average amount of flavor and a minute alcohol warmth was left behind for me to enjoy. Overall, I thought this was a good beer for the most part. It’s a good representation of the style. It made for an easy drink and I found this to be most enjoyable on the “lazy” afternoon of which I tried it. I think this could be a great after dinner drink or a suitable sipper on a cool evening. I would recommend that you give it a try if you see it. It has a great aroma and flavor, which warrants some serious pondering in my opinion. As I’ve mentioned before in previous posts, this particular style is not my “go-to” beer, but I could have it again no problem. 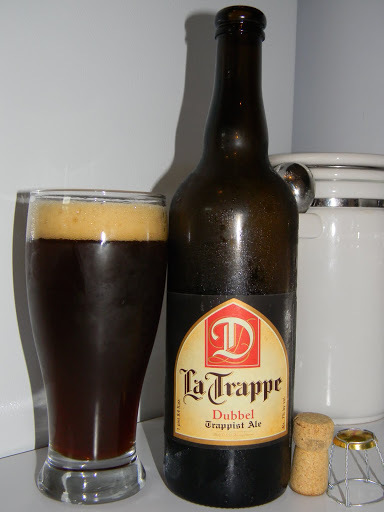 Has anyone out there tried the La Trappe Dubbel? What did you think of it? Thanks for reading everyone. Keep the comments coming.